German Shepherd Dog Forums > Training & Behavior of the GSD > How do I (teach my dog to)? > How to maintain focus during initial excitement/reactivity from meeting a dog. My dog can walk pass other dogs without caring about them after around 2-10min of gradually getting close while keeping her focus, the time depends on other dogs, for whatever reasons she has a noted distaste for husky looking dogs despite me remembering no significant ill encounters with them, also she cares much less about small breed dogs in general. However it seems despite however many practice we do, when she first sees a dog on a walk she still goes bonkers if the other dog is on the same side of the street unless I take her to side streets ahead of time. (This noticeably gets better for the second or third dog we meet on the same walk though, it is first dog on a given walk she reacts most strongly to) I have to start approaching the first dog at the same distance (5-10meters or 1.5 to 3 of regular car lane width depending on dog) every time if I don't want her to react and it seems like we can not get any better than that distance. This is a dog who i have trained to walk through groups of feeding pigeons within step distance without giving her time to prepare nor giving any commands and without her pulling or even caring about them much. But I can't seem to get any improvements on that first non-react distance with other dogs. There seems be a an intense excitement when she sees a dog for the first time during walk (has to be seeing, she doesn't care about other dogs if she can't see them even if she hears dogs barking at her from a near house) and it breaks her focus on me unless we are a set distance away and i can't seem to improve that. I guess my question really is how can i train her to just walk pass other dogs on the same side walk without caring about them much like the way she can after several min of gradually approaching but without the gradually approaching part. Or rephrase the question like any tricks for decreasing the starting working distance of a leash reactive dog after reaching a limit in our current training? Last edited by DaBai; 04-15-2019 at 03:05 PM. excellent question. I also have a bit of a thing with that first dog meeting. It is almost like I need to remind my dogs that we are not here to meet and greet. That first bark I tell my dogs that I hear their alert and then we do a quick direction change to break any constant eye contact. When we do pass we keep moving. If we get a good clean pass, I reward with a jackpot or playing. To be honest, if we are walking in a neighborhood, it is just easier to cross the street or move out of the way. It isn't so much that I don't trust my dogs but I don't trust the other dog walkers. 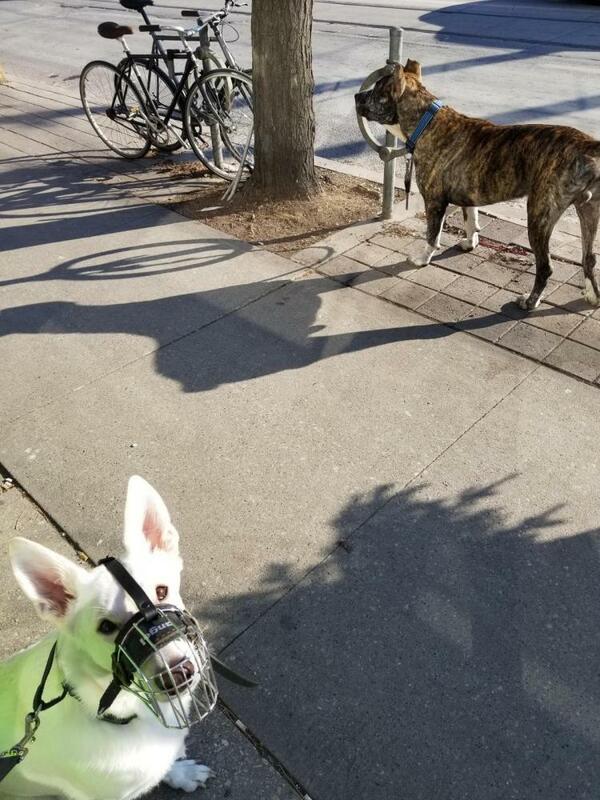 So many of our dogs don't get a chance to learn to socialize with other dogs, living on the end of leashes. And too often people allow too much nonsense at dog parks for dogs to learn there. I'll be watching the replies, here as well. I'll be watching for the replies also. My son is still taking rescue Heidi out to public places and she's still super dog reactive. active but after careful introduction during several visits, she learned to be fine with them. Not so with any strange dogs. She's so bad she's embarassing. There has to be something to try that's the magic cure. I'll be watching for the replies also. I can guarantee that there is no magic cure, but with work we can teach our dogs that there is a better way to handle things. The only magic cure that I've ever found is work/practice! It is human nature to avoid things that are unpleasant, like walking your reactive dog by or around other dogs. But that's exactly what they need! 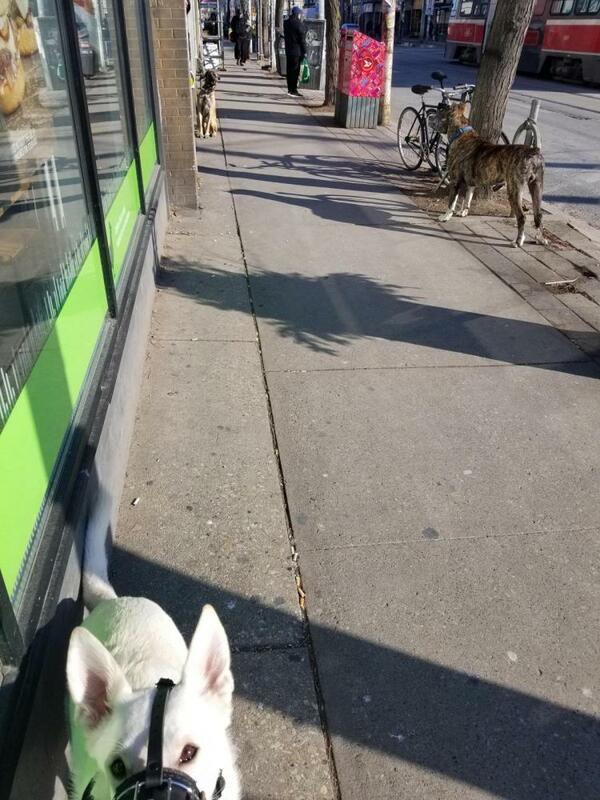 If when you go out you only see a few dogs out and about, find a new location with more activity. What I found with both of my previous dogs who were reactive on leash is that while that initial encounter took the longest to overcome, we made greater progress by sort of flooding them with encounters - purposely going to parks or neighborhoods with many dogs. Once that initial excitement wears off, your dog meets the next dog more calmly, giving you more and more opportunity to reinforce good behavior. It is sort of counter intuitive, but it works! Orphan Heidi and sweetasHoney like this. Also...think about how close you really want to get!? Same sidewalk, for me, is too close for comfort. Just today we passed another large dog. Rumo was calm, walking by my leg (“stay close”) and I took up about half of his slack leash. The other dog was calm, held tightly near his owners. We drew level with them and then without warning, the other dog lunged sideways at us!! His owner staggered and nearly fell. All of Rumo’s back fur stood up. It was a total silent surprise lunge! CometDog and Orphan Heidi like this. This reminds me, when we take up the slack in the leash we have to be careful not to send our dogs the wrong signals (yes, I am reminding myself). Take up the slack but don't start to tighten up the leash, leave a little slack. Watch your breath. We start to prepare for trouble and our dogs can notice that..."oh, that dog up there is worrying my human. I need to be on guard." Do your best to breath slowly and not clinch your fist or pull back on the leash. not saying that is what happened with Rumo. It just got me thinking. Orphan Heidi, Judy Untamed and sweetasHoney like this. My dog had to be corrected for acting like a thug. I had Max in obedience class and nose work class for a few years always get my practice in also make supervised to help with any timing issues. We did a lot of focus work. I watched a lot body language in my dog and eventually became pretty quick. Nose works was also something that we did and I enjoyed seeing how he would work with me and ignore all the many dogs a few feet away with just a wire gate seperating us off lead. What’s always worked best for me is leave it command. Instruction must be given to the dog before there is any reaction from the dog- if you have a reaction then you are just to late. The command must be taught without distractions first. Leave it gave us ample practice with out major distractions and then easily added them in. I liked the word because max was very familiar with the word. The correction has to be strong enough for him if he ignores your leave it command /instructions and to realize he can’t do that.I used a leash pop with a prong collar- herm sprenger neck tek- if instructions are blown off because that’s what worked for me also ecollar and had trainer show me timing and a trainer to show me how to use the ecollar -wrong messages can get jumbled and could easily make matters worse. Now just a reminder word leave it with just a jiggle to the leash -Reminds him to not to be a punk. Body language is so important as car2ner suggested. I have noticed when other people have walked max there was much less or little concern about other dogs. I have also noticed when we had come across a very aggressive , larger intense strong dog - like the giant intense Rottweiler whose owners barely could control while walking through the park staring at Max Max behaved like a perfect dog - with volunteered focus on me and no acknowledgement of this dog whatsoever at the beginning of our learning and peak of brattiness - he showed me how capable he was- so that defiantly helped in our venture. Last edited by Jenny720; Yesterday at 09:53 AM. In a nutshell.....adherence to commanded obedience in the environment where the dog loses it's crap......appropriate reward when applicable.......and at the end of the day........diminishing a dog's reactivity also changed my "reactivity". car2ner and CometDog like this. 1 Attachment(s) Go to first new post Dog Hair!